I have read some questions you answered about screw removal but they were for hamstring done ACL reconstructions. 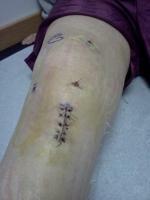 I had ACL reconstructed about a 1.5 years ago with my patellar tendon used as graph. I was wondering if I would be able to have my screws removed even though I had a patella graph? And if so how long would the recovery be?